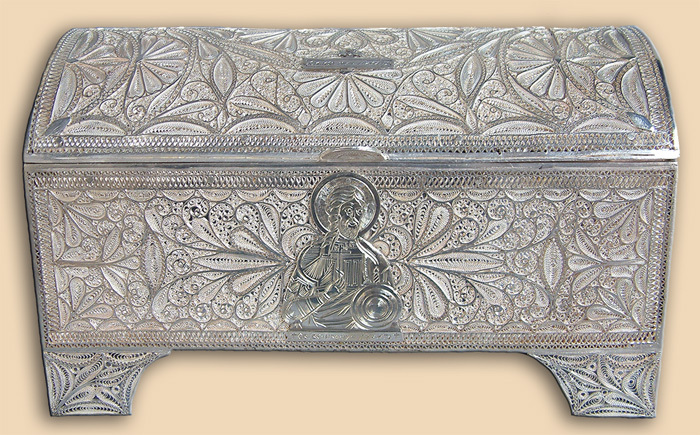 Silver reliquary from Duboki Potok Monastery in Zubin Potok, Serbia. Technique: filigree, granulation, stone setting , chasing, engraving, repousse. Size: 24 × 12 х 13 cm. Commissioned by: Father Romilo. Abbot of Duboki Potok Monastery. In possession of: Duboki Potok Monastery, Kosovo and Metohia - Serbia.